Last year I had the privilege to review the Olie pullover from Sunice and came away more than impressed. For the last few weeks I've had the opportunity to put Sunice`s Bollon Flexvent Jacket through some testing in various Fall conditions here in the Ottawa area. 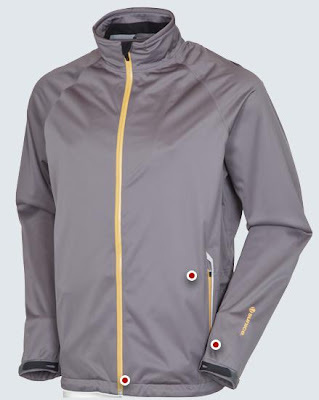 The Sunice Bollon Jacket is part of Sunice`s Tornoado Waterproof Golf Apparel line. Autumn in Canada can be pretty harsh when your on the golf course. Most days golfing you`ll encounter weather variable including but not limited to wind, rain, sun, sleet and snow. The Sunice Bollon was created with golf and those variables in mind. Waterproof Finish- The fabric that the Bollon jacket is made of is amazing, water beads off the surface keeping you dry and warm. It`s a high performance laminate called Flexvent, and it truly is top notch. I never had to worry about rain in a round when I had my Bollon Jacket on. The waterproof zippers, lycra action cuff tabs, and patented v collar with neoprene finish round are also great touches from the Sunice Bollon jacket that keep the water out and your core warm. The Bollon Flexvent is an incredibly soft feeling jacket. Brilliant, that is still manages to be waterproof and lightweight as well. Sunice even backs it up with a 4 Year Waterproof Guarantee. I really like the way the jacket fit. An XL was perfect for my built. I had ample room to fit an extra golf shirt underneath but still fit snug enough to reflect wind. I could swing freely wearing the Bollon jacket. Which is one thing that nice you don't have to worry when your golfing in the Fall. Additionally the jacket is so quiet you won`t be disturbed by noisy fabric like most rain gear. Cool Factor - in-pocket ball cleaner - Most golfers will have a towel/cloth to clean their golf ball/club but Sunice by adding one in your pocket is genius making it easier/faster to clean your ball/club during your round. Nice touch! If your a golfer that doesn't want to worry about the elements when golfing then the Sunice Bollon Jacket is the perfect addition to your golfing needs. At a suggested retail price of $230 it will immediately pay dividends by keep you dry, warm and happy during your round. Pair it with some of Sunice's other golf apparel and your envious playing partners will be looking to borrow your gear when nasty weather strikes. Wonder if they got jackets in XXXL size for me!.